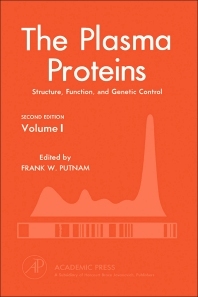 The Plasma Proteins: Structure, Function, and Genetic Control, Second Edition, Volume I is a systematic account of the structure, function, and genetic control of plasma proteins. Clinical relevance is introduced in terms of principles, with emphasis on human proteins. Animal proteins are also used as examples in some cases. Comprised of nine chapters, this volume begins with a historical background on plasma proteins, along with their nomenclature, characterization, and genetic markers. The primary structure and three-dimensional conformation of plasma proteins are also considered. The discussion then turns to the chemical, physical, and biological properties of various plasma proteins such as serum albumin, lipoproteins, and immunoglobulins. Subsequent chapters deal with protease inhibitors in plasma; purification, physical properties, chemical composition, and molecular structure of transferrin; biosynthesis and metabolism of serum lipoproteins; and physical, chemical, and functional properties of the proteins of the complement system. The final chapter is devoted to ?2-microglobulin, with particular reference to its purification and physical properties; chemical composition and structure; physiological function, biosynthesis, and catabolism; and presence and function in cell membranes. This monograph will be of interest to molecular biologists and biochemists.